The flexibility of SCENAR to adapt is its key to success, and yours! Holding a real-time conversation with the body’s own healing systems SCENAR relies on the fact that the body is a large, bio-electrical machine which uses complex feedback mechanisms to maintain stable internal conditions. This process is called homeostasis. Homeostatic mechanisms are regulated by nerve signals which release biologically active chemicals called neuro-mediators into the body; the most important of these are neuropeptides. 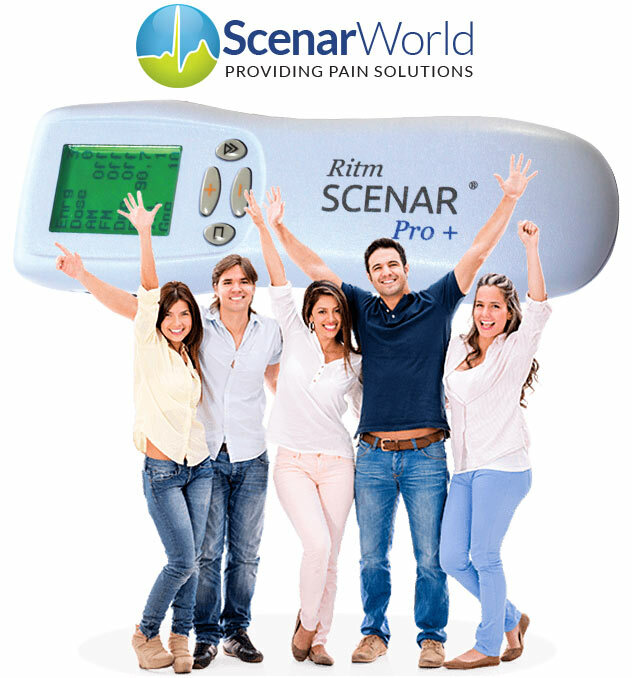 The aim of SCENAR therapy is to induce the release of enough neuropeptides to relieve pain and initiate a healing sequence through the body’s own active feedback mechanisms. Electronic stimulation of the nervous system is widely used in hospitals to alleviate pain. 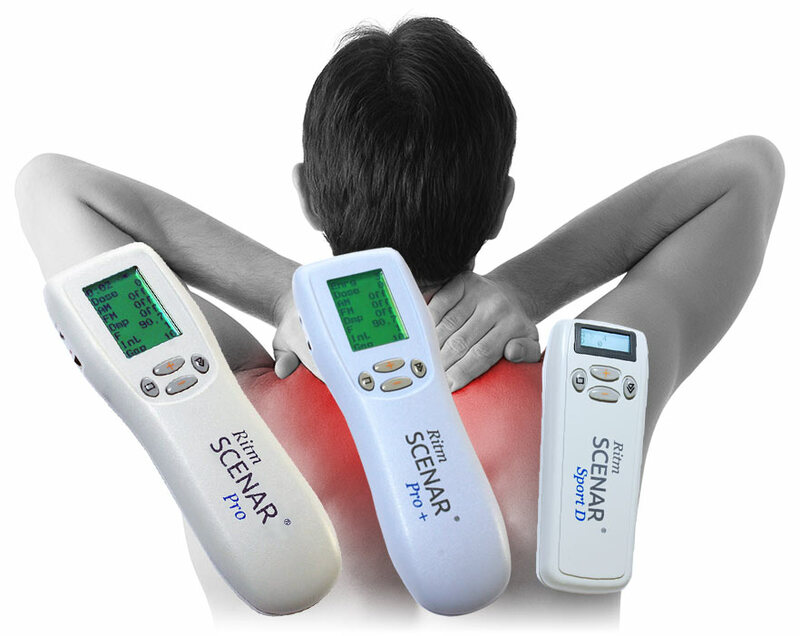 Like other bio-electrical devices, SCENAR transmits electrical impulses, from an electrode in its hand-held unit, through the skin to the nervous system. 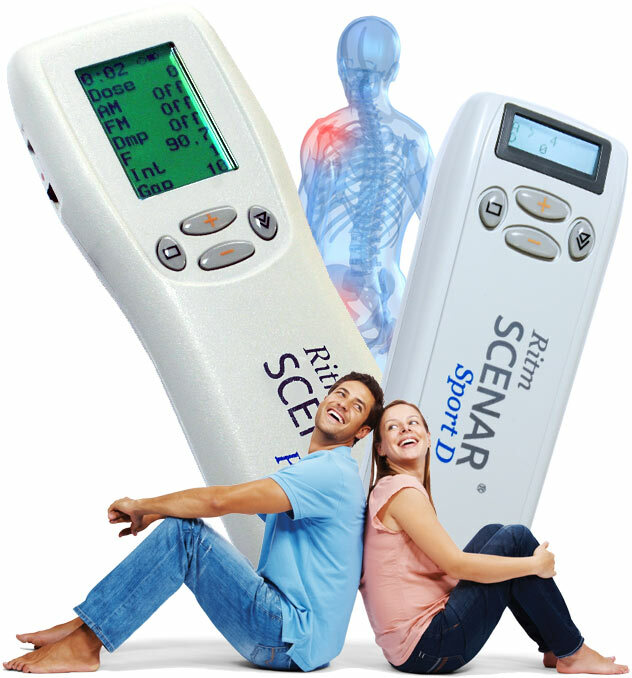 The difference lies in the ability of SCENAR to react to changes in the body’s response to those impulses. 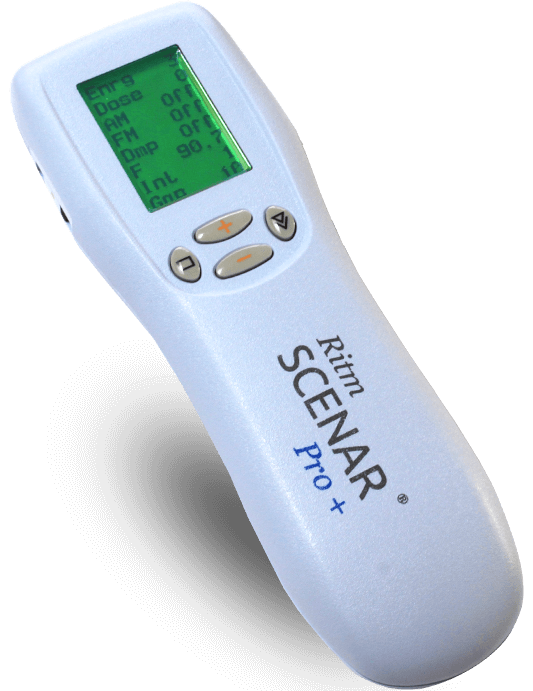 The device monitors changes in the electrical impedance of the skin (a measure of its resistance to electrical current flowing through it), detecting any impedance changes as the body reacts to its impulses. It then responds in kind, adjusting strength, frequency and timing for the optimal response. The electrical impulses produced by your SCENAR device are similar to the body’s own neurological impulses, so the body reacts positively to them. They are particularly effective, compared with other technologies, at stimulating C-fibres. 70% of nerves in your body are C-fibres. Much smaller than other nerves, they are found in every part of the body. They carry sensory information from the periphery to the brain and produce a lot of neuropeptides. SCENAR technology is unique because it genuinely interacts with the body’s own healing mechanisms, communicating directly with the nervous system to stimulate neuropeptide release. 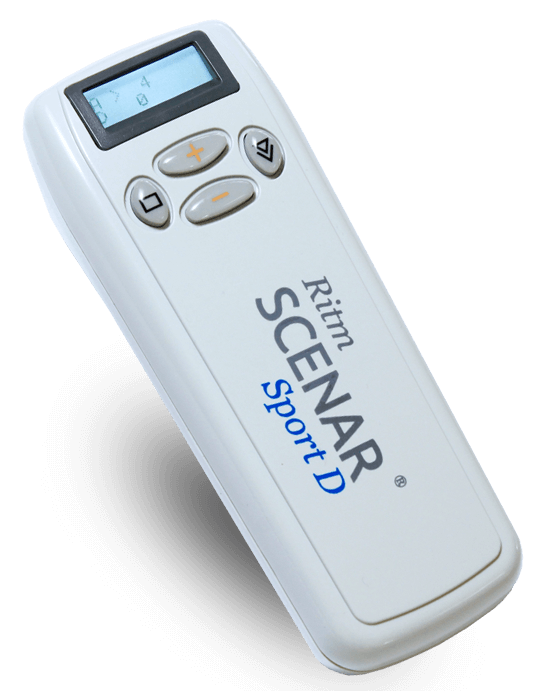 The SCENAR enables practitioners to communicate directly with a client’s central nervous system, stimulating the natural adaptive processes of the body and nervous system so that the body can heal itself. 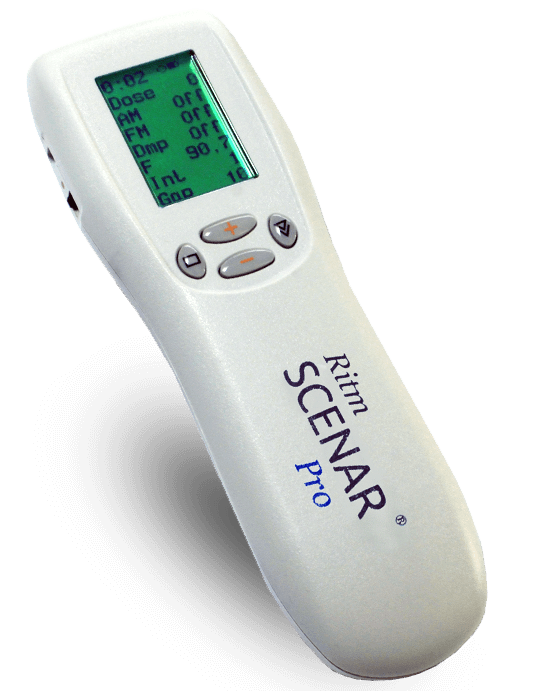 How you use SCENAR is determined by the appearance and location of primary and secondary signs of a health problem, or problems, on your patient’s body. Primary signs refer to the patient’s complaints such as pain, inflammation, swelling or a loss of sensation. Other primary signs include obvious injuries such as wounds, rashes, ulcers, scars and discolorations. Secondary signs are the patient’s response to SCENAR treatment. They can be any localized changes that take place during or immediately after treatment and don’t necessarily appear on the immediate area under treatment. A planned treatment course is a pre-set algorithm aimed at stimulating the body to deploy its own healing mechanisms. The treatment session lasts around one hour for most people. For acute injuries the treatment time is usually about 30 minutes. The practitioner brushes the hand-held device over the appropriate zone until the patient feels a slight tingling sensation. It may be slightly uncomfortable but not painful. The patient encouraged to report any changes or sensations experienced. The aim is to achieve a change in your patient’s condition during the treatment and in some cases they may feel worse immediately after the treatment. In most cases a patient requires a minimum of 3 treatments (some acute conditions may resolve sooner). Further treatment may be performed on the area of pain after the initial treatment and can take place up to several times a day, with a minimum of two hours between each session. SCENAR has been reviewed in medical journals globally since it was developed in the 1970s for the Soviet Union space project. Over the past four decades a large body of case studies has been built up supporting the benefits of the device created by inventor Alexander Karasev. They tend to agree that when used properly, SCENAR can produce startlingly swift results from the start of treatment in cases that would otherwise require invasive surgery under orthodox western medicine practice. As a result of those studies, some of which are linked below, SCENAR has been adopted by health practitioners worldwide and could provide huge benefits and savings for governmental health budgets. I fell heavily onto my left hand, twisting the thumb at a right angle. This left major bruising and swelling in the thumb, wrist and hand, and significant pain, especially at night. With professional SCENAR treatment, I was surprised to see the bruising and swelling reduce in even the first treatment, and after several treatments, the pain at night had gone.